Product #556 | SKU FLEX-RC1 | 0.0 (no ratings yet) Thanks for your rating! 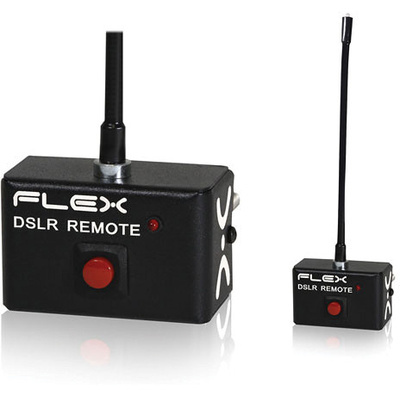 The FLEX is a patent-pending, handle mounted DSLR remote unit that triggers HD video start and stop recording for Canon 5D/7D. The FLEX’s unique gooseneck arm houses an optic to be positioned within line of sight to the remote sensor on the Canon cameras(transmits up to 1m away, 135deg spread). Once positioned, the remote transmits a signal through the optic when the button is depressed. The arm can be extended up to 12" and coils down to approximately 3" in diameter. The FLEX's all metal construction will standup to the everyday rigors of HD DSLR video production. Max clamp diameter 1.5". Powered by 2 included AAA batteries.